My edition: paperback, published on 31 July 2014 by Pan Macmillan, 420 pages. Description: Marie Dunwoody doesn't want for much in life. She has a lovely husband, three wonderful children, and a business of her own. Except, her cupcakes are crap. Her meringues are runny and her biscuits rock-hard. She cannot bake for toffee. Or, for that matter, make toffee. If you've been infected by Great British Bake Off-fever like the rest of the nation and don't quite know what to do with yourself in between episodes, then What Would Mary Berry Do? is the calorie-free solution to the endless Bake Off-less hours that will otherwise likely be filled by consuming copious amounts of cake. At the start of the novel Marie couldn't be more different from her almost-name-sake Mary Berry. A disaster in the kitchen, her children get worried when they are served a home-baked cake rather than the supermarket's finest processed and prepackaged sweet rush. But after yet another disaster at the school fair - Marie forgot that she volunteered to bake something for the cake stall and ended up offering just-on-their-sell-date French Fancies from the local petrol station mini-mart - she knows this can not go on any longer. Marie has to learn how to bake. Armed with Mary Berry's Complete Baking Bible, Marie takes a vow: For next year's fair she will bake a spectacular and scrumptious show-stopper. Not only will she no longer be an embarrassment to herself and her children, but with it she'll also, finally, be able to triumph over her nemesis and neighbour Lucy. What follows is one woman's flour-coated fight against the baking odds, from unexpected tasty successes to all the kitchen disasters you can possibly imagine. In between the greatest challenge of her life (or at least the greatest challenge involving an oven), Marie has to juggle her marriage and kids, work and even has to play nice with perfect little home-maker Lucy, which results in some unexpected surprises for the both of them. What Would Mary Berry Do? does not only look fingerlickingly sweet, but the contents perfectly match the fabulous title and cover illustration too. 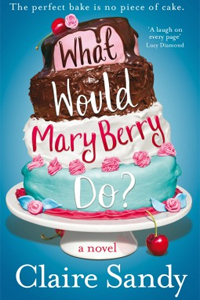 It's like author Claire Sandy had her own bake off where she mixed together all the ingredients needed for the perfect novel; a likeable main character with a loveable husband, adorable yet feisty twin girls (they reminded me of the characters I used to look up to in Enid Blyton novels), hilarious co-workers, money worries and a tortured teenager to provide some tension within the story, and of course lots and lots of different types of cakes and other baked goods that will make your stomach growl while reading. The novel is a gripping read, filled not only with plenty of humour (I was cracking up continuously at Sandy's hilarious descriptions of whatever situation Marie got herself in to this time) but also with a lot of hearth. This is a very warm story, and I don't mean the heat from the oven, which is used extensively within the pages to create all sorts of scrumptious baked goodies. No, this is a book with a real feel-good factor. Do you need something to cheer you up (because it's another 12 hours until the next episode of Great British Bake Off)? Then this is the perfect pick-me-up. You will laugh, you will smile, and you will appreciate home-made sweets like never before. I'm no Mary Berry, but after having read this wonderful novel, I believe Claire Sandy deserves to be awarded the title of Star Baker. What Would Mary Berry Do? is an absolutely wonderful and heartwarming story, one which you want to curl up with for a cosy afternoon with a freshly brewed cuppa and of course a large slice (or two) of your favourite cake. Many thanks to the author for a copy of the novel in exchange for a honest review.